September is all about self care, so the launch of That Natural Hygge, the newest natural retailer to hit the internet, could not have come at a better time. But this is not just your average beauty shop -- no, not at all! That Natural Hygge expertly blends wellbeing, skincare, and self-love, making for a shopping experience unlike any other. "Hygge, as we often share is the Danish term for creating that comfortable moment either alone or with friends and family, having a complete absence of life’s stresses, strains or frustrations. 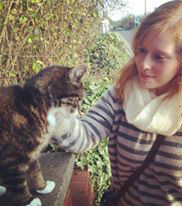 Often carried out with food, drinks, blankets and soft candle light." And that is just what Lou, founder of That Natural Hygge, aims to achieve with the range of products she has hand selected to have on offer. From cleansers to candles, every brand available matches the ethos and views of this eco-sustainable business. Now, I received a special Blogger Box from the lovely Lou for the launch of That Natural Hygge, and I have to say I was completely blown away. Perfection begins from the moment you open the box, as dried flower petals and lavender sprigs sprinkled throughout the package give off such a gorgeous scent from the get go. Plus, all the products are tucked so snugly inside so they look stunning from the very start. Everything about my box from That Natural Hygge is exceptional, from the presentation to the products selected. Lou selected three deluxe samples and one full size product for me, and she could not have picked better treats for me to test out. On top of everything being suited to my skin type, each item was part of a whole routine so I could have my own little hygge moment! You all know by now how much I love a good soak in the tub, so this little sample bottle of bubble bath from 100 Acres was the perfect pick for me. Ranked one of the top ten all natural bubble baths, this blissful formula is about more than just the foam. Rose and lavender essential oils combine with chamomile, ylang ylang, and clove to create a dreamy scent ideal for relaxing and calming the nerves. You need to use a fair amount to get a good set of bubbles going, but with how affordable this bottle is I can't complain. And once you are laying back in the warm sudsy water, all you will be able to think of is closing your eyes and letting go of the day's troubles. I have had a look at the rest of the 100 Acres range, and I am so looking forward to having a bit of a shopping spree when I am off my spending ban. I have my eyes on both the bath oil and salts, plus one of their newly arrived candles -- now that will make for the perfect spa evening! "ISUN products have been consciously formulated to provide a ‘Quantum Healing Effect’ for total well-being – body, mind and spirit. This means, that beyond the obvious effects that support more youthful, balanced, radiant skin, ISUN skin care products also support overall physical and emotional health and well-being. There is a purpose in this. When we are better balanced physically, mentally and emotionally, our hearts are more open, we tend to feel better about ourselves and more loving with others. 1. They are created from inception with positive, clear intentions. 2. They are made from pure, unadulterated, life and health-giving ingredients. 3. They are made with living, high life-force ingredients. ISUN skin care products meet these criteria, providing a foundation for inner and outer radiance. This makes it possible to experience an inner feeling of total well-being and greater awareness of the true nature of self, others and nature." How could you not want to try this brand with a message and practice like that?? The creamy cleanser is much more rich than what I am used to, as it contains both coconut oil and avocado oil/butter. It will be fab for the cold and dry winter months when my skin needs more moisture, so I will be saving this for another few months before fully trying it out, as I want to be sure my skin will not become congested. I will say, the sample product looks like it will be really tricky to get out of the vial, but I would much rather have to think of a simple solution (I will use a toothpick to get my first application out, then add a tiny bit of water to make the second one come out smoothly and cleanly) than have packaging that threatens the environment. I really love that even the little sample size comes in glass, and this little detail has won me over completely to the brand even before I have tested out the cleanser. I adore Bodhi and Birch, and love everything they stand for as a brand. 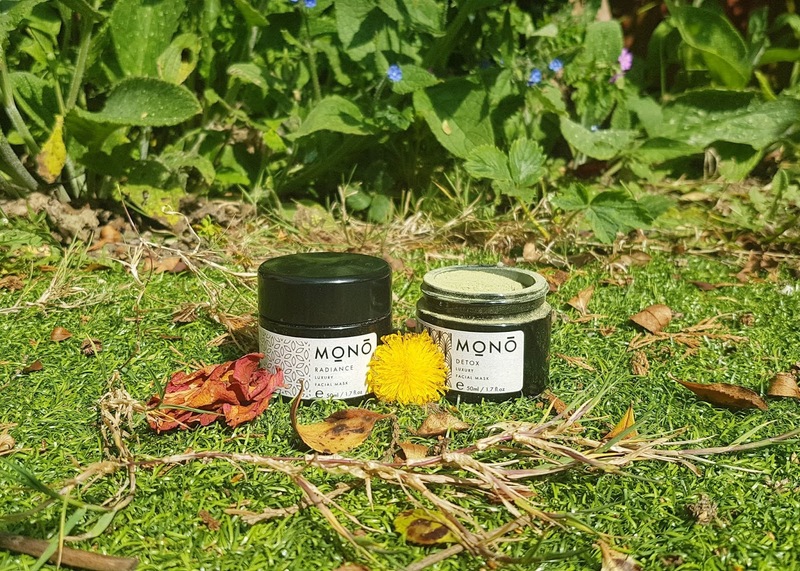 Made in England and packed with outstanding ingredients that have been ethically sourced from sustainable areas, each product I have had the pleasure of using has been incredibly luxurious, great for my skin, and warms my heart. When they announced the Superfoods Series, my jaw dropped -- how could this brand get any better? Well, this serum is the epitome of next level skincare. With 25 super-powered seed, nut, fruit, and berry oils, this Bodhi and Birch oil is a masterpiece. "Formulated with an impressive who’s who of nutrient dense superfood oils boasting potent actives, powerful antioxidants, polyphenols, phytosterols, EFAs and vitamins to target principal signs of skin degradation and ageing." And it really delivers. The formula is rich in colour (almost orange) but delicate, and it sinks into skin so well. It absorbs fully, so you are not left with a heavy or slick feeling on your skin, and despite being so jam packed full of different oils, it does not congest or irritate the skin at all. Everything is perfectly balanced, and even the smell elicits peaceful vibes -- it brings to mind tamanu, but is softer and has a sweetness behind it that calms the mind. This is my second mini bottle of the Super25 Botanical Serum (review of the line coming soon! ), and I could not be happier to have a backup! I will be using this one as a mixer, as the blend is ideal for adding a few drops to anything you could think of. My next face mask is going to be out of this world! One of my favourite floral waters is from Alteya Organics, but I had not yet ventured into their wider skincare offerings. Lou chose the perfect scent for my introduction into the brand's facial care products, as I am currently obsessed with anything jasmine scented. I was immediately sold on Alteya Organics' Illuminating Perfecting Face serum with my first sniff of the fragrant and seductive floral notes. Red and Blue Algae – helps increase skin’s moisture capacity and provides essential antioxidant protection. It helps uniform skin’s tone, illuminates, and helps detoxify skin. Better yet, it is suitable for even sensitive skin, so I get to enjoy it without worrying my skin will react poorly! This has been one of my favourite additions to my skincare routine lately, and I am so thankful to have been sent this fab green goodie! 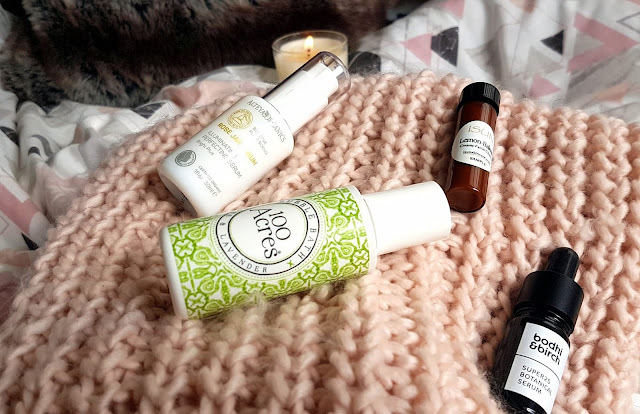 That Natural Hygge stocks a wide range of products from all four of these gorgeous brands, as well as eco-friendly accessories like the famed jade face roller plus green goodies from Mage. And, from what I can gather from sneaky peeks over on their Insta, there will be even more joining this amazing lineup soon! I have perused the website many times now (I mean, there are just SO MANY amazing items to lust over!) and I love how easy it is to navigate. Each section is clearly labelled and sensibly structured, and I appreciated how many answers are provided in the FAQ section. One of my first is always 'how much is shipping going to cost me' and I really like how transparent That Natural Hygge is about prices -- each possibility is spelled out, and I love that there is a reasonable minimum spend for free shipping (just £30!). My only suggestion would be to add full ingredient lists in the future, as I personally will not buy a product without seeing the full label first. 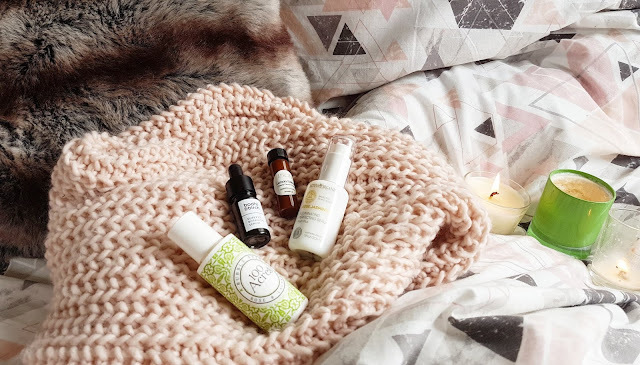 Having semi-sensitive skin, I am very careful about what I use, and while I know the brands available on That Natural Hygge are clean and pure, I still like to double check everything. This is especially important for anyone who has allergies or who have lifestyle requirements (such as vegan or halal). While you can look up the full list on each brand's own website, it is always more convenient to have all the information in one place. I adore what That Natural Hygge brings to the world of natural beauty and wellness. There are many online retailers out there that offer a huge range of brands, but you cannot always trust that ethics and quality are always at the forefront. There are very few shops that place people over profit, and all the little touches that have gone into just this one parcel show that this business is special. That Natural Hygge believes "your beauty routine isn't just about the products you put on your skin, but the way it makes you feel." You can feel the heart behind the business, and that has completely won my trust, respect, and appreciation. That Natural Hygge is perfect for celebrating self-care, such a great idea from Lou! Amazing box with some gorgeous products! 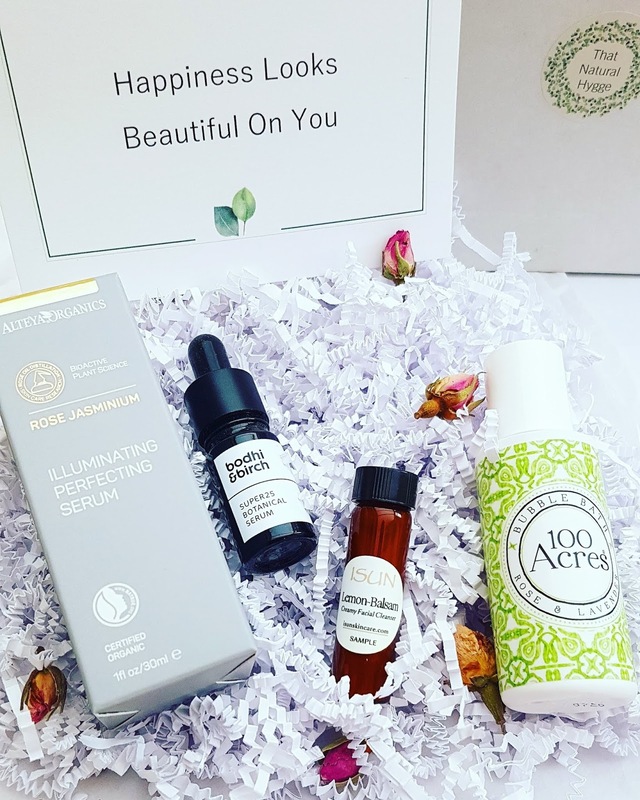 The serum from Alteya Organics is going straight to my wishlist, it sounds really good..
Those products all sound amazing - I really love the sound of this box as it is so important that people practice self care. These sound very promising and Id like to try these products. Self care is really important but many people ignore it. Natural Hygge sounds like a great place to order from. It is lovely to know about ethical websites. Lovely to hear your thoughts on That Natural Hygge! I'd like to try more ISUN products, the cleanser you tried sounds awesome! They're a new shop to me, and look great! I'd especially like to try some Bodhi and Birch products.